Toby is now 7 months old. He is a gentelmen, vey loving and funny at times, trying to please his owners and great with kids and other dogs. He is truly a blessing to our family. Happy New Year from Toby to all his friends! Happy New Year Toby and family! Happy New Year from Luc. 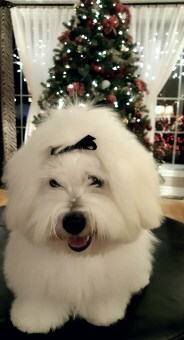 Wishing you lots more Coton fun and love in the new year!